Another problem with trying to clear up the disputed claims of the German pilots is the loss/destruction of the entire Generalquartiemeister claims list for 1944. Without this record not one kill by any Luftwaffe pilot during 1944 cannot be researched or verified other than by word of mouth or the still unverified Jagdgeschwader records. Thanks Digger for rescuing this topic off the Royal Navy discussion. I think the problem shouldnt be that much, there is plenty pilots log books to contrast the claim/kills. The people always focused in the Eastern Front but there was several cases of clear cases overclaim in the West, like the Walther Dahl case. Here's a nice article on overclaiming by the Luftwaffe. 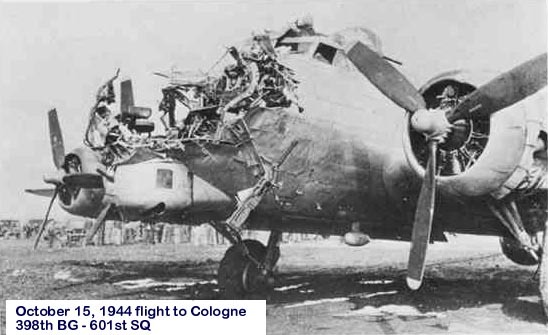 While I was aware that Luftwaffe claims were as wild as anybody else's, when fighting over disputed territory, I was rather shocked at the amount that was overclaimed during the 8th USAAF long range attacks on Germany, when they could count the amount of shot down aircraft. mkenny, I value anyone's posts on this subject and let me assure you, your contributions are welcome. Let me also assure you this thread is not about proving Nazi uber myths, not by any stretch. For a variety of reasons many German claims cannot be proven, particuarly for the year 1944. Perhaps gun camera footage which is quite substantial, is the only sure way to verify kills for that year. Yes, there were false claims by German pilots. This was no different in any air force. Were some claims deliberate falsifications? Definately. the case of Winck and his wingman and possibly his entire unit caused quite a ruckus in the Jagdwaffe and a further tightening and scrutiny of the claim process. As already mentioned Dahl was another pilot with rubbery figures and some of Gollob's claims have been called into question. These are but a few. the interesting thing it was the Germans themselves who uncovered the discrepencies. Goering knew overclaiming was going on, that some pilots suffered from throat ache and he was most scathing in his criticism of some pilots. This led to clashes with Galland in particular and partly led to a falling out between the pair. Galland refused to wear his decorations for a year. As an interesting stat US losses of these aircraft over Europe are B-17's 4,754, B-24's 2,112, P-47's 1,043, P-38's 451, P-51's 2,201. Obviously the various tactical air forces and support aircraft aren't included, nor are the not insubstantial losses of the RAF. Not for one minute am I suggesting the Jagdwaffe was solely responsible for these losses, they weren't, but even accounting for the losses by flak, someone was sure as heck shooting down large numbers of Allied aircraft. So to assert all German figures and claims are incorrect and deliberately so is as bad as believing all the German claims are indeed correct. Somewhere in between there is a balance, but I personally do not believe we will find it. The overclaim in the bombers thing is explainable in two parts. However a hss bomber sometimed reached his base even in (poorly state) and that you get the difference. Panzerknacker. I for one, do not think the vast majority of Luftwaffe pilots were liers. Its a fact of air warfare that in battles of more than one or two aircraft, overclaiming is common. This is due to the fact that if someone shots at something and a few minutes later see's a plane fall out of formation, he tends to assume its the aircraft he shot at. Any pilot who attempts to keep track of the aircraft he shot at instead of looking out for aircraft attempting to shoot him down, is unlikely to live to shoot at another aircraft. The thing that annoy's me about the subject of overclaiming by the Luftwaffe is the fact that some posters refuse to accept that Luftwaffe claims can be incorrect, while being quite happy to pour scorn on any Allied claims. Everything is debatable, but in this past years I saw the other thing in many forums, allied claims are the Bible, and german claims ( in any category) are subject to every kind of suspicious comments. An interesting article about Hartman claims and debate about the dates, locations and so. Really,Major Erich Hartmann claimed, and was credited with, shooting down 352 Allied aircraft, including 348 Soviet and four American. His colleagues in Luftwaffe 52th Fighter Squadron, Gerhard Barkhorn and Gunther Rall , claimed about 301 and 275 victories. These figures contrast sharply with the results of the best Soviet fighter pilots: I. Kozhedub had 62 victories , A. Pokryshkin had 59 and N. Gulayev had 57. But few people realized that there is no validity of comparing the results of combat activities of pilots who fought in different conditions and with different intensity of combat operation. No one tried to assess the value of such a factor as "the biggest number of victories" from the point of view of the system of the Air Force of the whole country. What do these numbers tell us: what is “hundreds of downed” : “girth of a bicep”, or “body temperature of a patient with fever”? The answer to this question is not as obvious as it may seem at first. As a rule, the party who loses the air war has the highest number of individual pilot's scores. Pay attention to this: not one, two or three fights but the air war as a string of battles. This phenomenon manifested itself already in the First World War. For example, the German pilot Manfred von Rihtgoffen shot down 80 Allied aircraft; it was the highest result among fighter pilots 1914-1918. During the second World War it happen again, not only on the Soviet-German front. At the Pacific Ocean there were also people like Hartmann. Tatsugo Iwamoto ,a Japanese lieutenant of naval aviation, knocked seven fighters «F4F» «Wildcat", four "P-38" "Lightning", forty eight «F4U» «Le Corsaire", two "P-39" "Cobra", one "P-40 ", twenty nine« F6F »« Hellcat ", one" P-47 "" Thunderbolt ", four " Spitfire ", forty eight bombers« SBD »« Dauntless ", eight bombers" B-25 ". Just over Rabaul the ace won 142 victories in air combat; and totally he has 202 (!) Downed aircraft. Another Japanese fighter pilot, Lieutenant Hiroyoshi Nishizawa, shot down 103 (according to other sources - 86) American aircraft. The american pilot with the highest scores in the same battle ground, Richard Ira Bong, shot down 2.5 times less. On Bong’s account there are even fewer downed aircraft than I. Kozheduba had: there are 40. We can see an absolutely identical picture if we look at the "low-intensity conflict": Soviet-Japanese border incident in Khalkhin Gol. A Japanese pilot, Hiromichi Shinohara, claimed that he downed 58 Soviet aircraft from May 1939 until his death on August 28 in the same year. 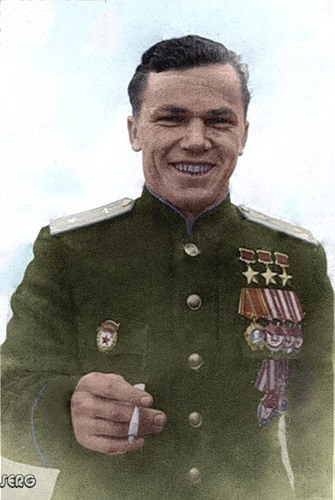 The best Soviet pilot inKhalkhin Gol, Sergei Gritsevets, had in his account 12 Japanese planes. The reason why Luftwaffe aces scored so high lies in the extensive use of the German Air Force (6 missions a day by a single pilot in major operations) and a larger number of targets due to the quantitative superiority of the Allies ( the probability of encountering an enemy aircraft in the sky was higher). The top German ace Erich Hartmann had 1425 missions, Gerhard Barkhorna had 1104 missions, Walter Krupinski (197 victories) had 1100 missions. I.N. Kozhedub had only 330 missions. If you divide the number of missions by the number of downed, then the German top aces and best Soviet fighter pilot had roughly 4-5 missions per victory. 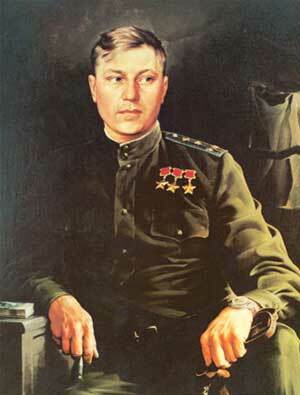 It is not difficult to guess that, if Kozhedub had 1425 missions, he could have easily downed three hundred planes. But there was no practical sense in that. If you want to perform 60 missions a day to covering your bombers and ground troops or to intercept enemy bombers, then you can make it with ten aircraft and exhausted pilots having six flights a day; the other option is to make it with sixty aircraft and pilots having one flights a day. Soviet Air Force chose the second option, the command of the Luftwaffe - the first. High intensity of Luftwaffe aircraft use was the result of the Third Reich commandment strategy ; they tried to cover a huge front with the means clearly insufficient for this task. German pilots fought almost without stop. They had to serve different parts of the front, depending on defensive or offensive operations. The Luftwaffe strategy allowed the aces to increase scores, but in the long run it was a defeat strategy. One of the participants of the battle on Khalkhyn Gol, a Japanese fighter pilot Ivory Sakai, recalled: "I have done 4-6 missions a day and in the evening I was so tired that I almost did not see anything. Enemy planes flew at us like a huge black cloud, and our losses were very heavy. "The same could be said about the Luftwaffe pilots fought on the Western and the Eastern Front during the World War II. So were the fantastic kill claims by the likes of Hartman, Barkhorn, Rall and the other high scoring Experten of the luftwaffe, indeed genuine? At some time or other there have been serious challenges to these claims, some of them backed up by facts, some purely from jealousy or politics. It works both ways, as claims by the top Soviet aces have been challenged in the west. Allowing for the natural tendency to claim a victory in a confused combat, it is obvious many cases of discrepencies were of an accidental nature rather than a deliberate deception. The Luftwaffe claim process was quite complex and hundreds if not thousands of claims were still awaiting recognition in Berlin at the end of the war. Of course the process was far speedier if there was a witness to a claim or wreckage recovered. Similarly the introduction of gun cameras from 1942 cleared many disputes and false/accidental claims. Would have the top Allied pilots have equalled the experten of the Luftwaffe? Certainly if they had fought under the same conditions the top Allied pilots would have amassed incredible scores. I made the same claim and response on many of the Youtube films showing and eulogizing german aces. But I couldn't (spend the time to) back up the thesis with raw data. At begin of war; germany could find the target french, british , Dutch, Polish, Russian planes easily at the designated enemy airfields. Parked,taking off or landing. PLUS little or no antiaircraft defence. In reverse , the f,b, p, r planes could not hope to raid (in strength) the german known airfields. And if so, the flak was already solid. Besides flying in a Rudel (14 Me109s?) against 3 allied planes is a CERTAIN 3 kills for the germans..the one allied pilot of the 3 will NEVER be able to outsmart 14 opponents. And between the germans pilots in a group, it is the "proven" ace that CLAIMS his victory, and doesNOT allow his wingmen to make the kill. Later in war, with Germans in defence..the german aces KNOW where to find their opponents; from the airfield it is immediately vectored to the allied bombers and their defending fighters. Bigger chance for a kill per plane for the germans than for the allied (who started flying from far away bases...more idle flying time)..
Another "trick" of the germans is to leave the primal "wrestling" of large airbattles to their lower esteemed partners (Italy, Rumania, Hungary) and follow up the endphase with arriving with their "aces" in force to mop up the enemy resistance and claim the kills. (Really, not at all different from playing War Thunder ). This canadian commonwealth ace who flew in defence of Malta made this observation. Last edited by Frankly Dude Really; 03-29-2016 at 06:24 AM. Very interesting comments. Frankly, it would seem very difficult, at this stage, to evaluate the kill claims of Luftwaffe fighter pilots, or to compare them with the fighter pilots of other combatants. Apart from destroyed records, there was substantial variation between the protocols operated for the confirmation of kills and shared kills. To take one example - the Soviets appear to have required physical confirmation of kills. This tended to drive down the numbers of confirmed Soviet kills, as kills over enemy-controlled territorys could not be physically confirmed. As regards the Luftwaffe, in the absence of many relevant records, it is difficult to say what their confirmation procedure actually was. Claims seem high - but possible. I hesitate to mention it - but there is also the little matter of the German propaganda machine, and its enthusiasm for promoting propaganda "poster boys" for its own purposes. This went beyond the equivalent tendency in other WW2 combatants by some way, and would have resulted in the legitimation of kill claims that, perhaps, went beyond the probable. We shall, perhaps, never know ... JR.
That's an interesting and simple statistical method of combat effecivenessy, that gives us an unique resault . I would like to compare the soviet top aces scopes with allied ones. Anyone has the simular statistic kills/flyes for the best allied pilot-fighters?